It’s hard to believe that nine months of the year are already behind us! The year is going by fast and while I feel I’ve made progress with my “recovering shopaholic” project, I know I’ll need at least another year (if not longer!) to get to where I want to be. I have to continually remind myself that after over three decades of compulsive shopping behavior, I won’t conquer my problem overnight. As with all major life changes, it takes time to recover from shopping addiction. Doing my monthly accountability updates is helpful, as they keep me aware and honest about my behavior. As I prepared my August accountability update, I was shocked at how many new pieces had made their way into my closet. This month, I was much more conscious of my shopping and as a result, my wardrobe additions were fewer and more well thought out. I still feel I made too many purchases, but the pendulum is swinging in the right direction. Read on for a full update on what left my closet, what came in, how much I spent, what I wore, and how I fared in adhering to my shopping rules. During September, I purged nine items from my wardrobe: seven garments and two pairs of shoes. Sadly, four of these pieces had been purchased within the past year! In addition to posting photos of what left my closet (click on the image for a larger view), beginning this month I will also list why I decided to release these pieces. These nine items left my closet during September 2013. Black brocade coat – As I mentioned in my “Learning from Our Shopping Mistakes” post, this coat was too small in the shoulders and should have been returned instead of altered. I love the style, but the fit was off and the coat was just too uncomfortable to keep! Black and white print cardigan – I bought this cardigan on sale in 2011. While I love the print and style, the 3/4 sleeves are just too short and always had to be adjusted every time I bent my arms! Often, 3/4 sleeves just don’t work on my long arms, as they end up being more like 1/2 or 2/3 sleeves! I decided to pass this sweater on to someone with shorter arms. Black and white coat– This coat was also mentioned in my shopping mistakes post. It was a HUGE mistake to order a final sale item online! Again, the shoulders were too tight and I tried to salvage my faux pas through alterations. It was throwing “good money after bad” and something I don’t plan to repeat! Green coat – I actually wore this coat quite a bit since I bought in in 2009. However, I now prefer a more streamlined fit and smaller pockets, plus I realized that this shade of green is not one of my best colors. I have lots of coats, so I opted to pass this one on. Watercolor print skirt – I bought this skirt two summers ago to wear during the trip my husband and I took to Hawaii. Unfortunately, I didn’t wear it once we returned home to San Diego. Since I don’t take many island vacations and hadn’t worn the skirt in over two years, out it went. Fuchsia top – This was another sale purchase that should have been left in the store. Although I love the color, the neckline was too wide and the side ruching was unflattering in my tummy area (which is one of my better areas!). I have other pink tops, so I let this one go. I added six new items to my wardrobe during September. Four of these pieces were consignment acquisitions made using credit I’d accumulated for selling some of my cast-offs, one was a gift, and one was a retail purchase. Here’s a photo (click for a larger view) of my September closet additions. These six pieces were added to my wardrobe during September 2013. Black suede pumps – Most of my pumps are open-toe styles, so I bought these shoes to wear on cooler days. I’m hoping to wear skirts and dresses more during the colder months and these shoes will make it easier for me to do so without getting (literally) cold feet. Black and blue print top – Most of my long-sleeved tops are very casual in nature, so I decided to purchase this dressier style. The colors are two of my favorites and I love the print (the blue spots are actually little birds!). Black long jacket – This is the piece I wish I would have left in the store. I bought this jacket as an alternative to the open cardigans I often wear on cooler days. While I like the brand (Cabi) and the style, the jacket was just too big! With consignment acquisitions, you get just one size option. This jacket fit me in the shoulders and the sleeve length is perfect, but both the sleeves and the torso area needed to be taken in considerably. The jacket is back at the tailor now for additional alterations. Fingers crossed it will work for me, but never again will I opt to re-work something so significantly! Black and white striped skirt – While I have several black print skirts, I actually wear them all, and I know I’ll get good wear out of this one. It’s a quality jersey fabric and fits me very nicely and comfortably. The waistband needed to be altered, but I think the skirt will work well for me. Houndstooth coat – I’ve long wanted a houndstooth coat, so I was thrilled to find this one a few weeks ago while at the mall with my husband. Although the price tag was somewhat high, we learned the coat was on sale! So my husband offered to buy it for me as a gift using some of the money his mother had given to us for our anniversary and his birthday (we used the rest of the money to buy some new shirts and pants for him!). It won’t be cool enough to wear the coat for probably two months, but with the crazy retail cycles and our late summers, few coats are left in the stores by the time we actually need them here. This coat only needs minor alterations and I look forward to wearing it come winter (such that it is here). Black and white striped cardigan – I didn’t really need this cardigan, as I already have a cream and black striped cardigan I wear frequently. However, this one looks different enough and is a bit dressier in style than the one I already had. I’m a huge fan of both black and white and stripes, so hopefully this cardigan will be worn a lot this fall through spring. Rather than consigning these items and earning pennies on the dollar, I opted to investigate the possibility of dying them black. I thought of Tim Gunn from “Project Runway” and how he always tells the designers to “make it work,” and I made a decision to do just that. Fortunately, I found a local cobbler who expertly dyed my brown boots and handbag to the rich deep black I prefer. I dyed my brown purse and boots black so I’ll use them more often! The only downside is that the patent details on the purse now appear more matte in texture. It’s a different effect, but I still like it. I hadn’t used the brown purse in over two years, but I know I’ll use the black version in the coming months. In my August accountability update, I had to report that I was over my 2013 clothing budget by $138.29. I’m pleased to announce that as of the end of September, I’m back on track! In fact, I actually finished September having spent just $64.40 on clothing-related expenses. I bought a pair of workout/lounge pants and the black and blue print top above (most of the other new items were bought using consignment credit and the houndstooth coat was a gift). I’m now under my 2013 clothing budget by $47.31. I know that’s not a lot of money, but I have not adhered to a clothing budget even once since I started setting them ten years ago! So I have to pat myself on the back for doing a lot better with managing my shopping this year. Am I Following My Shopping Rules? I feel this rule helped to save me from some bad purchases during September. Instead of buying more jackets and short-sleeved tops (relatively easy items for me to find), I was forced to consider other areas of my wardrobe. For October, the field has been narrowed down further, as I haven’t even worn all of the new items I bought during August! If I want to shop now, I have to focus on buying the hardest items for me to find, skirts, dresses, and pants. In the long run, I feel my new shopping rule will help me to address actual wardrobe gaps instead of merely shopping as a hobby and buying still more tops and toppers. Targeted shopping is not as fun and it doesn’t provide the type of escape I crave when I hit the shops, but it will help me to create a more manageable wardrobe that works for my individual lifestyle. That’s one of my most important goals for 2013 and beyond, so I’m willing to endure some discomfort and shift my relationship with shopping in order to reach it! During September, I continued to track all of the clothing and shoes I wore, as I found this practice highly enlightening during July and August. I started the tracking as a sort of “Reverse Project 333,” but instead of stopping at 33 garments, I opted to continue just tracking what I wore in the hope that I would gain some useful information about myself and my wardrobe. I definitely find it helpful to list what I’m wearing for the various occasions in my life. It’s helping me to learn what I like to wear, what I wear most often, and what I don’t reach for when getting dressed for my days. This has assisted me in letting go of a number of other pieces over the past three months. I wore 27 garments and 8 pairs of shoes during September. This number is considerably less than my July and August totals, mostly because I didn’t get out of the house as much last month due to both illness and lack of plans. I wore three garments twice. I wore one pair of shoes twice. I wore two pairs of shoes three times. Everything else was only worn once. I am continuing to track what I wear during October. I may opt to do another round of Project 333 beginning in either November or December. Where I live, our summers last until at least early November and I would prefer to do Project 333 when the weather will be more stable. Although I know Project 333 can be successfully done in highly variable climates, I still feel like a novice in “dressing with less” and the process of selecting my 33 items was very stressful when I did the challenge back in April. I’m still pondering what’s next, but I know I need to continue to challenge myself. The bottom line is that I want to be wearing – and loving – what’s in my closet. During Project 333, I actually liked the majority of my outfits, which wasn’t the case earlier in the year when I was trying to wear and evaluate all of my “wardrobe benchwarmers.” I’ve continued to be happy with my outfits over the summer, as I’ve gotten rid of a lot of things I didn’t love and that didn’t work for me. I still have too many clothes, but I feel my wardrobe is more stable now and will continue to be streamlined in the coming months. In upcoming posts, I will do another “wardrobe benchwarmer” update, offer some insights into how my views on shopping have changed, and delve more into the exercises in “To Buy or Not to Buy.” I’ll also share useful links posts on successful shopping and “shopping your closet.” If you have any suggestions for future “Recovering Shopaholic” posts or if you’d like to do a guest post, please contact me to offer your ideas. Welcome, Kali, and thanks for your comment. Yes, I find the monthly updates very helpful in keeping me on track and moving me in the right direction. I like the name “New Guest lists” for keeping track of new purchases. I plan to list and analyze all of my 2013 purchases soon (or at least by the end of the year). I suspect that exercise will be quite enlightening! But their loss is to my benefit. I figured out if I dyed them a dark spruce green they would then become my dark green and coordinate with the new green pieces I have introduced for fall. Now that you have done it successfully, I see it’s possible! I might even do it myself rather than to a shoe shop because I used to work in leather years ago (created custom handbags) and I am somewhat skilled in finishing leather, but I have never redyed shoes. So it will be an experiment. Thanks for giving me this inspiration! It came at just the right time! I’m glad my post inspired you to take the plunge with dyeing your shoes, Deby! Spruce green sounds quite lovely. I would be nervous to dye my own shoes, but since you have skills with leather, I suspect it will work out nicely for you. Let me know how it goes! Do you enjoy putting your outfits and different styles together as much? Yes, I’m very detail-oriented, Cornelia! And I DO really enjoy putting outfits together. Every few months, I take a few hours to play in my closet and take photos. I haven’t done this since May, so I’m overdue. It really helps me to see and appreciate what I have more. There are far more combinations in most of our closets than we realize! Debbie – congratulations on all your success! You’ve been diligent about keeping up with your blog and your wardrobe-winnowing…I really just let my blog fall by the wayside but it’s not what’s important to me now, kinda like the clothes you let go. Man, I’m impressed that you thought of dyeing your boots and bag – great idea! You are definitely a “winter” so I am sure you’ll get tons of use out of those two now. But I also discovered a pedorthist at a New Balance store who fitted me perfectly for a new pair of running and tennis shoes. Then, he mechanically stretched them in the forefoot to accommodate my newly-discovered (or should I say, newly “accepted”) wider foot. I immediately got rid of the old ones: one-in, one-out. Anyway, I like how you were able to let go of quite a few more items. I am inspired by your journey. I also started following a minimalist blog called Becoming Minimalist, and I receive a free newsletter from My Private Stylist (the typos are a bit annoying but there’s good info) to keep me motivated and moving toward making more of a capsule wardrobe that I can change with accessories. A question, do you buy most of your clothes online or in-store? I don’t have much time to shop in-store and find myself overwhelmed by choices, but hesitate to buy online in case I need to pay again to return and re-buy. Sorry to hear about your foot problems, Lil, but I’m glad you’ve found some relief since you’ve come to understand what you need. Fortunately, there are a lot more options for wider feet these days. I’m glad that buying newer hangers has helped you to get rid of things you don’t wear. Congrats on coming up with a solution that works for you. To answer your question, I buy most of my clothes in the store, as I have trouble with fit when I order online. When I do order online (which is maybe 20% of the time), I only order from companies who offer free shipping. I hate having to pay extra for shipping and returns. I know that shopping in stores can be overwhelming, but it’s much easier if you shop with a list and only look for what’s on your list. I love the Becoming Minimalist blog and read it all the time. I have heard of My Private Stylist but don’t get their list. Typos would bother me, too! When I find one on my blog, it really upsets me, but I know that nobody is perfect! Ah yes – a list WITH me. I had one hanging in my closet but I’m putting it in my phone tonight! Debbie I love the new rule and believe it is something we should all practise no matter the number of clothes we own! Sorry to hear you’ve been unwell and hope you feel better now. You should feel proud at least of being under budget so enjoy your successes. Thanks, Megan! I’m glad you like the new rule. It’s turning out to be even more helpful than I thought it would be. I got exhausted and overwhelmed by trying to shop for pants on Sunday (more on that soon), but at least I didn’t end up buying a bunch of stuff I didn’t need. I AM proud of being under budget! It’s uncharted territory for me, but it feels good. Looks like you did well this month! I’m glad that August gave you good insight and lessons. Did you find any pants when you went on Sunday? Thanks for asking, Tonya! No pants, sadly. I actually didn’t try as many on as I had hoped, as I wasn’t feeling all that great (and I hate shopping for pants). I will keep trying… I did find a nice skirt, though! I had wanted a new grey skirt since my old one was an alterations casualty in May, but it proved to be difficult to find. I spent quite a bit of money on this one, but for me a grey skirt is a wardrobe workhorse. I’ll keep trying with the pants. My goal is to find two pairs by the end of the year. Better to buy one great skirt than several just okay ones! Maybe it would look nice with your black benchwarmer boots for fall and winter? Good idea! I’ll give it a try. I definitely want to start wearing skirts and dresses more during cooler weather and the boots will help with that. Your new shopping rule, ‘I cannot buy a new item within a category until I’ve already worn all of the other new items within that category’ is very similar to a few rules I am doing for my own shopping. 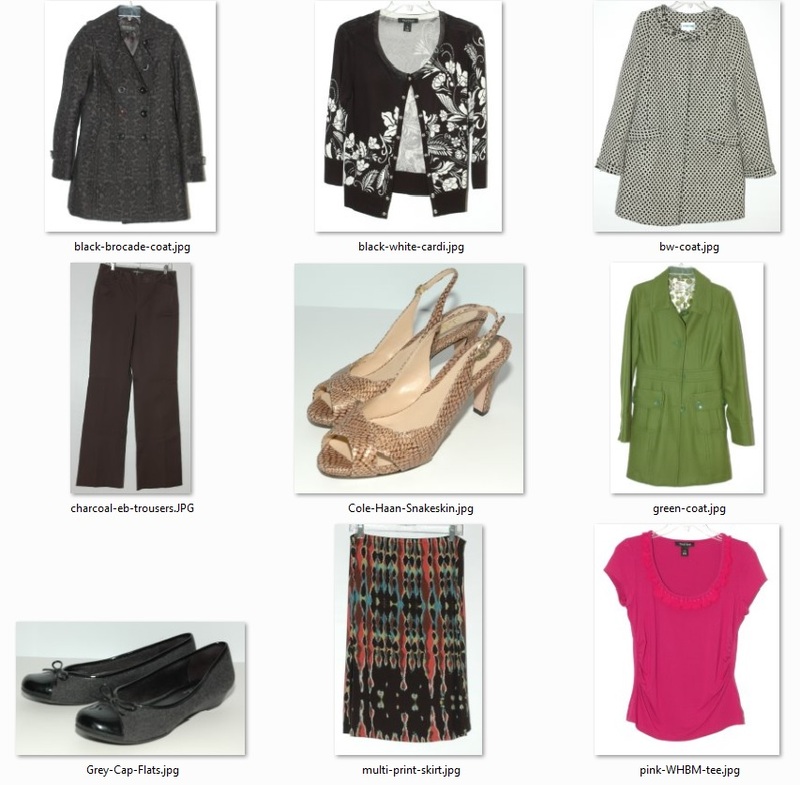 I cannot shop for new items unless that wardrobe need cannot be filled with an item from the ’boutique’ AND, I cannot add a new item unless I purge an item from the working closet. If I purchase a new item and I do not want to purge an item, I end up having to put the item into the boutique. Since I want to eventually close the boutique, this is counterproductive. Also, it’s no fun purchasing something new and realizing you won’t get to wear it for a year, two years, or longer! I’m not using this rule anymore, but I may go back to it… I really like your rules regarding the “boutique.” I’d love to read your initial post about the challenge, as it might be something I want to do. Do you have a limit on how big your working closet can be? How did you get it up and running to begin with? Did you have everything in the boutique at first and then move to the working closet as you wore it? I like the rule of having to get rid of something (or move to the boutique) whenever you buy something new. I am still buying too much, so I plan to adjust my rules yet again to try to mitigate that. Your comments give me lots of food for thought! 2. I started with everything I owned in a separate closet from my working closet. At first this worked rather well, as I was using the closet in a spare room. Until the shelf fell and I had to relocate all my items. Now everything is back in the working closet, however, since I am a visual person, all the ’boutique’ items are in opaque shopping bags, covered with tissue paper. The purpose of the ’boutique’ is to NOT see the items daily since they are NOT part of my working closet. 2. Yes, everything started out in the ’boutique.’ It was very interesting during the initial weeks to see how little items I carried over into the working closet. And yes, items were slowly added to the working closet as I wore them. When I first started the challenge, I was still purchasing new items. But it didn’t take long for me to see how slow the turnover can be. Items were not wearing out as fast as I purchased them, and I liked everything I was wearing. So this meant new purchases went right into the boutique! Well it’s no fun to purchase something and have to immediately put it on hold. I had to chuckle about the shelf falling with the weight of your clothes… We’ve had a few wood closet rod break from my closet girth. We now have metal rods, but my plan is to not have so much stuff that I need that kind of stability!